If a baby tooth is lost prematurely, you may need a space maintainer to "save" the space. What does that mean? Baby teeth are there for a reason. One key reason is that they save space for the permanent tooth, which will erupt into its position when the baby tooth is lost normally. 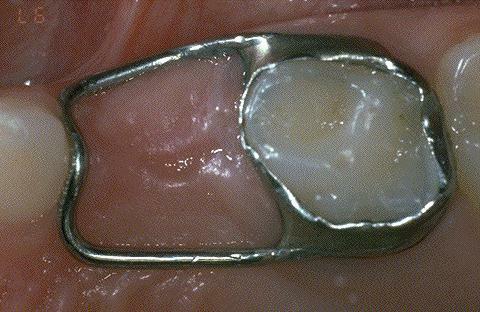 If a primary tooth (baby or milk tooth), has to be removed early due to say, an abscess, or is knocked out in some kind of trauma, a space maintainer may be recommended to save the space. 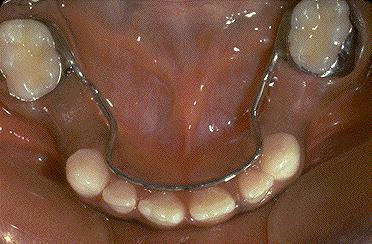 If the space is not preserved, the other teeth may drift causing difficult to treat crowding and orthodontic problems. If it is a front tooth then you don't need a space maintainer. 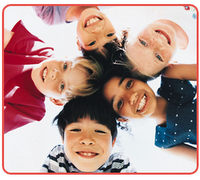 However, you can place a Pediatric Partial to replace the teeth for cosmetic reasons. Now "Spacers" may be in there for a while, but they are not permanent. 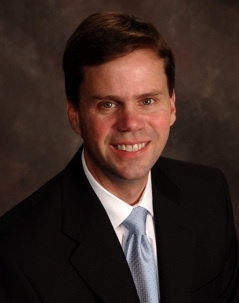 They are removed when the new tooth (usually a bicuspid) erupts or the abutment teeth get loose. a. Unilateral: Just on one side, usually "replacing" one tooth. Can be a band and loop as you see here, or a crown and loop type (in photo below). This can also be a Distal Shoe type. The distal shoe being one used when the permanent first molar has not yet erupted. Hey, you are usually going to get "silver" in there no matter what kind of spacer it is. b. Bilateral: These are very useful. They are usually cemented with bands on back teeth on both sides connected by a wire just behind the lower incisors. Usually called a Lingual Arch. This can eliminate the need for two unilateral spacers. They are most useful if there is more than one tooth missing or you are trying to keep the lower incisors from tipping. An altered form can incorporate a looped lingual arch to actually move the lower incisors forward (straighten them a little too) before maintaining them in a better position. 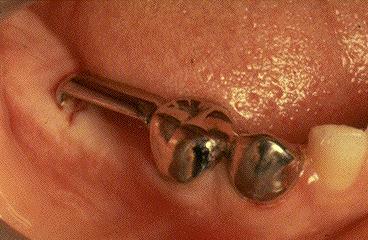 A maxillary bilateral spacer may incorporate an acrylic button and is called a Nance space maintainer. 2. Removable: I don't use these too often on children, although sometimes they can be fabricated and used in specific cases. 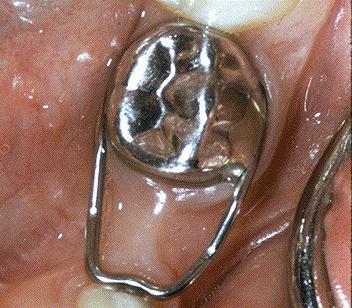 There are like orthodontic retainers, with part of the plastic placed in the empty space to keep things from drifting. *The Color are Photos from University of Washington web site demo. The X-ray is not. Hi, My 3 1/2 year old has just had her tooth pulled due to decay. It is the first mollar from front and is visible when she smiles. I was told she needs a space retainer and would like to know if there is one that is a white fake tooth, I was told she will probably not have the adult one come in until the age of 12 which is almost 10 years. Please let me know what the process is,if there is one of putting in a white tooth spacer instead of the metal bar cemented around the back tooth. The spacers you see here are pretty much what is available for 99% of cases. 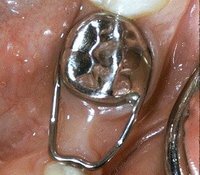 Removable acrylic appliances (like retainers) with a fake/plastic tooth are sometimes used on older kids/teens, but a three year old would take that out right away. A transpalatal arch or Nance spacer would not show as much from the side but would be more on the roof of the mouth and be an additional band on the other side as you see here. Sorry, but a band and loop is the best I know of right now (if I understand your situation correctly). Now if it's an upper front tooth, then check out my post on Pedo Partials that's where you can get a white tooth for that situation. You should ask your dentist, but I suspect he will tell you the same thing. Any contacts involving anything not to do with this blog can be sent to my office at Alabama Pediatric Associates (linked on the sidebar). My 4.5 yr old daughter had some cavities in her front two teeth. There was some cyst and boil kind of above those two teeth 10 dys back. to add to the trauma, she fell off in the playarea and gums started to bleed and those 2 teeth is now shaking a bit. My Pediatric Dentist says that the tooth is decayed and infected and need to be extracted. he too recomended the bilateral spacer shown here supported by the last teeth on each side on the upper jaw. I feel terrible too for what shes going thro, I have cried unconsolably, she is a very very pretty girl, I cant see her without front 2 teeth for many more years she is just 4.5 so I might go with the Spacers. any negatives or side effects in using them??? no real problems with reasonable care. Don't feel too bad. Many kids are in the same situation. It's us parents that seemed to be more concerned than the kids. You might want to read my post on fake baby teeth partials although there are a lot more problems with those. My 8-year old son had to have 3 teeth extracted. I was told that the space maintainers were not uncomfortable and would not affect speech. It's been a couple of days now and my son is complaining that it's hard for him to eat and talk. He is very frustrated and wants the space maintainers taken out. I feel so bad for him and I am not sure I made the right decision to have his teeth pulled so early. However, the dentist said they were too decayed. Are there any other options? Should I ask about having unilateral spacers rather than the bilateral. Would that get rid of the wire that runs along the teeth? I can't imagine him having to wear this appliance for the next 4 years. Sometimes you can do two "unilateral" spacers rather than one bilateral one, but not if there is too long a space there. Usually spacers are not uncomfortable unless they break or something. BTW, it takes about 5 days or so to heal (at least mostly) from extractions. My 10 1/2 year old daughter needs to have 3 baby teeth removed- molars due to cavities. Our family orthodontist said we should put in lingual arches ($1500) to maintain the space untilt he permanent teeth come in. Is this necessary? How long before the permanent teeth come in- the oral surgeon said he can see them on the x-rays and it will be anywhere from right away to 18 months. What do oyu think? Sometimes lingual arches (space maintainers) are not just to maintain space, but can serve other purposes. Basically though, they save space for the permanent teeth and do not serve a use once the new teeth are in. I can't say if this will help you or not. It's always ok to get a second opinion, but it is not an uncommon treatment. $1500 seems like a lot if it is just one lingual arch. I presume there is an upper and lower, ..that would make more sense. My 9 year old was just measured for space maintainers put in from the dentist. Is this something I should have had an orthodontist do, or is it okay for his pediatic dentist to do? Space maintainers may be placed by a pediatric dentist or orthodontist. --I do them every day. HI i'm 12 years old guess what 3 weeks ago i had to get 13 teeth pulled so i came home with 11 teeth in my mouth. it been about 3weeks and i been very good. but now i found out i have to get a space maintainer i have it in for2 days so far it bugs me!!! and it get very dry at night so keep water close to your bed. Hello. I am actually writing from Switzerland. My daughter is now 3 1/2 and both of her front top teeth (no 1 & 2) are out. The first one needed to be pulled as she fell and the tooth was knocked back and to the side so there was not way to save it. The second tooth had been damaged when she fell at the age of 1 1/2. There was damage (half of hte tooth was knocked out) but we were able to save it and it did well until the beginning of this year when it needed to have a root canal. We were hoping that the infection would not come back but it did and we needed to remove that one also. So now with 3 1/2 she has both front teeth missing. My major concern is that prior to losing the teeth she has been going to physical therapy for some motorskills challenges. Things are getting better but she is stuttering and has had problems with 's' and 'th' sounds. Since both teeth have now been removed, it is making this even more difficult. We will also be starting at a speech therapist shortly with her. My question is - does it make sense to have spacers put in? Our dentist in Germany said it is not necessary but knowing her history (he treated her until we moved 6 months ago) he would recommend it. He says it would also help as she is already VERY tall for her age and the expectations people have of my daughter are even higher now since she REALLY looks like a 5 or 6 year old. I would be interested to hear your thoughts on this issue. Thanks so much! 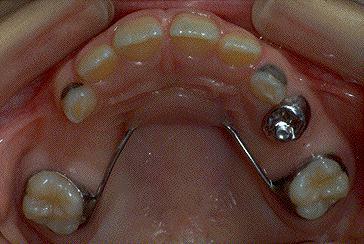 As I mentioned in the blog post, space maintainers are not usually needed (for space maintenance) for front baby teeth. In the back teeth, yes. You may want to read the post I made about Pediatric Partials (fake baby teeth). That is more for cosmetics and sounds like what you are asking about. It is always good to get more information. Thanks. 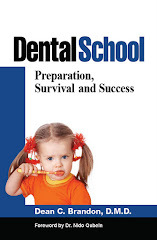 I had already read this blog on pediatric partials. The partials my dentist discussed seemed to be more like spacers. I will, however, forward him your blog. Thanks again so much for putting this information together on a blog! Honestly, had my friend in the States not told me about a friend's son having the same issues as my daughter, we would have never come upon the idea that there is help out there for my daughter! Many thanks! My 6 year-old son is having his second molar (upper left) extracted tomorrow morning. 4 months ago he had a cavity filled, the dentist nicked the pulp lining, the tooth abcessed to warrant a pulpectomy, and a month later (today) another abcess is resulting in extraction. It gets better: the premolar next to it is showing a dark spot in the root, when I saw the xray. We might be getting one spacer for the 1st molar, but the dentist warned he might later need to have the premolar removed, as well. I *obsess* over teeth. This is the ultimate insult to me both personally and as a mother. I am convinced that some people (my son, for example) are predisposed towards aggressive caries, while other people are somehow immune. Whether it's genetics or prenatal care (assuming normal dental hygeine) it is extremely hard for me to stomach this loss of control and ability to help my son grow healthfully. Also--forgive my rambling--will this spacer affect the growth of the opposing teeth? Will they drit downwards in search of contact? Will we need to be watchful of any side effects of this treatment? Thank you for keeping such an informative blog. I'm at my wit's end with helplessness. Space maintainers will not affect the opposing dentition during the time frames involved in normal dental development. Yes, some people are more "prone", in fact certain studies of the DNA of certain bacteria in children's mouths can be traced back to a window if infectivity when they acquire that cavity causing bacteria as part of the normal flora of the mouth. You may want to read my post on bad decay in a two year old. Im so glad I found this page - so much useful information with pictures. My 7 year old daughter needs to have 2 teeth removed because her 6 year molars are coming in right on top of other teeth. Her dentist said he will put in a bilateral spacer and it will stay in there until her permanent molars come in when she is around 11. Is there any disadvantage to using two unilateral as opposed to one bilateral? Thank you. Sometimes you can use two unilateral, IF there is the ability to have an abutment tooth on the other side of the space that will be there long enough. Lots of considerations that us dentists have ot think about there. I often will do two unilateral ones on the lower, but often need a lingual arch. The Nance (bilateral) is often used on the upper and can be a better option up there.